Beans and legumes have been a staple of many diets throughout the world for centuries. Some of the earliest crops were discovered in Thailand over 9,000 years ago. In Europe, bean harvests occurred much later. The term “bean” refers to an extremely large range of plants that belong to the Fabaceae or Leguminosae family that produce the seeds that we use for food. There is somewhat of a hierarchy of beans—the overarching species is known as the common bean. Just a few of these include string, field, French, and snap beans. 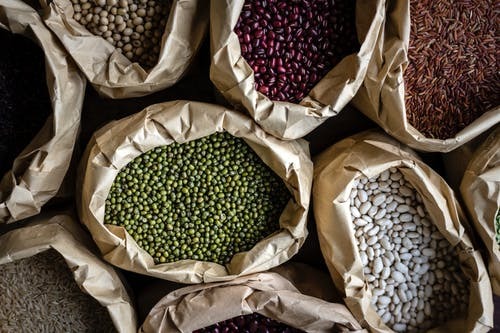 Subspecies are those that most commonly come to mind when we think of beans and legumes—navy, pinto, kidney, fava beans, and lentils. I was always confused about the differences between beans and legumes, and I’m sure I’m not alone in this conundrum. We tend to lump the two together and the names are often used interchangeably. Well, I am here to set the record straight and get to the bottom of the confusion. Legumes bear fruit that grow in pods. One surprising fact is that peanuts aren’t nuts at all! They belong to the legume family! Beans are the seeds from a very large group of plants. Something interesting about green beans is that they aren’t technically beans! They are classified as legumes! For gardeners, beans and legumes are a perfect solution to small spaces. Unlike gourds, root vegetables, and fruits such as tomatoes, beans and legumes grow upward. Their vertical growth makes for great use of a smaller space. They are ideal for those who are working with a smaller home garden and want to grow to produce efficiently. An up and coming theme in the health industry is sprouting. Of course, the process of sprouting is not a new concept, but the frequency has certainly increased in the last few years. While some might think it is a daunting process, it is actually quite easy to do. This website shares an easy step-by-step way to sprout! It’s probably not a surprise that beans are a healthy addition to any diet. They have been eaten for thousands of years and are still an inexpensive and nutritious stable for people throughout the world. It is well known among vegetarians and vegans that beans are an excellent source of plant protein, and when combined with grains such as rice, form a complete protein that contains all nine essential amino acids. Beans have also been shown to regulate blood sugar due to their fiber content. Those with diabetes or who are pre-diabetic should increase their intake of beans in order to stabilize blood glucose levels. Heart disease is another health issue that can actually be prevented and treated by diet changes. Lentils, a type of legume, contain magnesium which plays several roles in the body. A few of those are regulation of blood, nutrient, and oxygen flow. With low levels of magnesium, the body is at risk for heart disease, so make sure you’re eating plenty of beans and legumes! Beans also contain a huge array of minerals and vitamins. Some of these include iron, B vitamins, copper, magnesium, manganese, zinc, and potassium. As soon as it starts cooling down, I start thinking of all my favorite soup recipes. For as long as I can remember, my mom has made her famous chili recipe every year for Halloween. It is an inexpensive dish that takes minimal preparation and feeds a crowd. Over the years, I have made it countless times and have put my own twist on the original recipe. Next time you are looking for a warm, comforting dish, here is the recipe for you! Finely dice the onion, carrot, and garlic. Heat oil in a large pot. Sautee diced carrot and onion on medium heat until softened. Add crushed garlic and seasoning mix- cook for an additional 30 seconds. Add the beans once they have been drained and rinsed. Pour in vegetable broth, tomatoes, and corn. Add salt and pepper. Cook on medium-high heat until chili comes to a slow boil. Turn temperature down to medium low and let simmer for 20 minutes. Garnish with finely chopped green onion and serve! For more fun articles like this check out the Fill Your Plate Blog. Looking for some fun recipes to try for the family check out our recipe section. This entry was posted in Cooking, Fill Your Plate, Food, Food Facts, Healthy Eating, In the Kitchen and tagged Beans, Chili Soup, cooking, Healthy Eating, Legumes, vitamins. Bookmark the permalink.